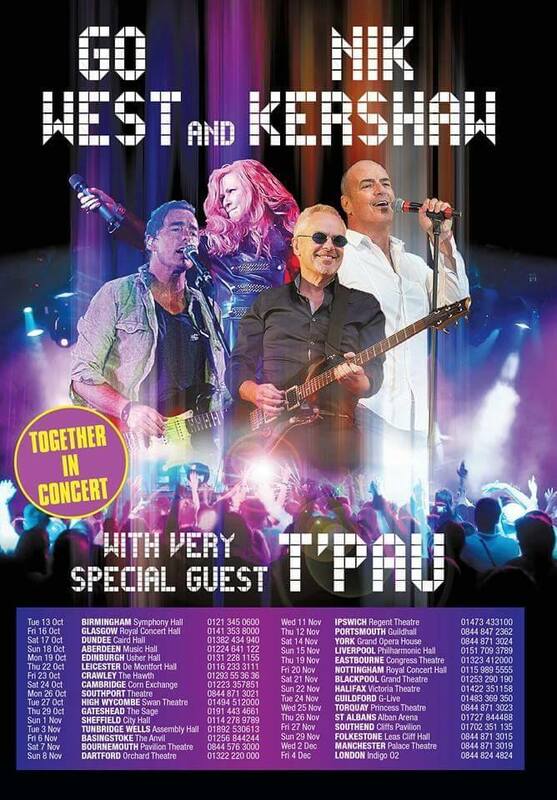 Tuesday saw 80’s legend’s Go West, Nik Kershaw and T’Pau take to the stage in Birmingham at the Symphony Hall, having been moved from the Town Hall due to unprecedented demand, to bring the 80’s (and more) to life. With millions of albums sales and iconic hits such as We Close Our Eyes, Call Me, King Of Wishful Thinking, Wouldn’t It Be Good, The Riddle, I Won’t Let The Sun Go Down On Me, Heart and Soul and the classic China in Your Hand, this authentic eighties triple header is not to be missed. Nik Kershaw loves being out on the road and recognises some of the faces in the audience. They were there many years ago – and now they bring their children to shows. “We are all a bit older but now people bring their kids too. We have all lived a bit of a life in the last 30 years. I am enjoying it more than I did back in the day. I am still grateful to be gainfully employed and it is such a privilege to walk out in front of people and get such a warm welcome. From my point of view, it’s brilliant and from their point of view they have grown up with these songs. It is a part of history, a part of their life and that is what they get out of it. Tickets are still available at certain venues. Visit https://www.facebook.com/OfficialNikKershaw/events for dates and all the links to buy tickets.